made available a unique original diapositive for this page. Click on image to view our high resolution scan, 161 752 bytes. 'Brissoneau & Lotz'. Final assembly took place in Bochum, Germany. There were initially 2 models, the GT 1100 (60ps) and GT 1900 (90ps). and are sometimes shown by Opel at German classic events. 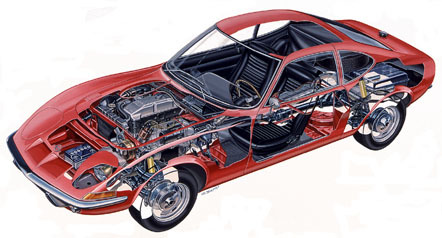 Production ended in August 1973, total production of 102463 cars. GT Club Wurttemburg e.V 'GT-NEWS ausgabe Nr 9, 1995.
for making available this and other useful GT material.